If there was ever a place to fall in love, it would be here. Any visitor arriving in Venice is immediately transported into another world, one whose atmosphere and beauty remain incomparable. Once a major maritime republic, now this island city draws artists, romantics, and architectural enthusiasts. At every turn of the canal, you will find the sidewalks lined with a luminous spectacle of ornate marble and frescoed palaces, bell towers, and domes alongside various shops and cafés that cater to visitors from across the world. Picture yourself at Café Venezia, a must stop for any traveler, offering fine Italian cuisine for the body and stunning views of Saint Mark’s Basilica at sunset for the soul. 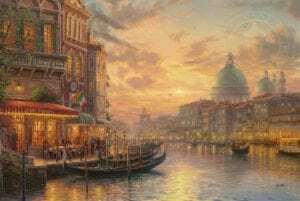 Allow Thomas Kinkade Studios to draw you into the sparkling waters of the Grand Canal under a blue Adriatic sky with the release of their newest painting, Venetian Café, a work that captures the tranquil beauty of Venice.